NO GO Clamp - Helps Reduce Rod Loss! What is a NOGO Clamp? In the age of expensive fishing equipment from rod and reel combos to lures and jigs, not having to worry about losing your pole just makes sense, right? That's why the NOGO Clamp was developed?it will help you ensure a nibble doesn't turn into an "OH NO!" by helping reduce rod loss. 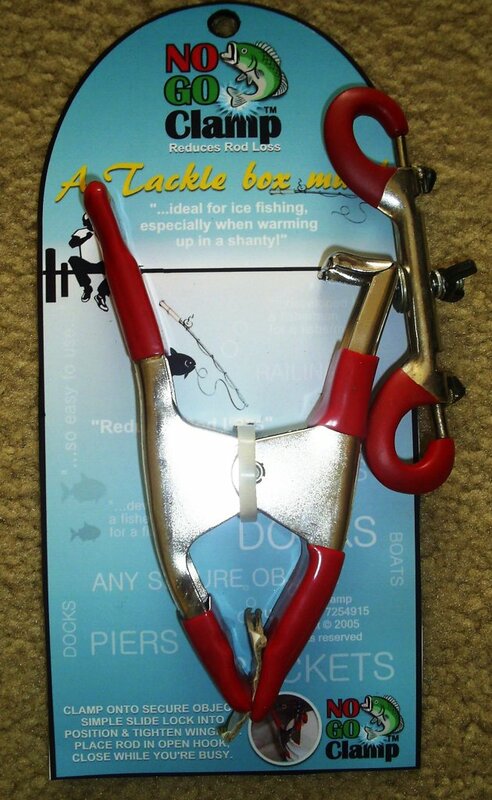 The NOGO Clamp is ideal for ice fishing, especially when trying to stay warm...a definite Tacklebox must! How does it work? The NOGO Clamp is a simple series of clamping devices that attaches one end to your fishing rod and the other to a secure object, such as a boat, dock, gunnel...the possibilities are endless. The NOGO Clamp was developed by a fisherman for a fisherman to solve a problem! Why buy it? The NOGO Clamp has been in use for nearly a decade and has sold off the shelves in the local area! It is a huge hit when marketed at local fishing derbies ? which makes for fun and easy sales! 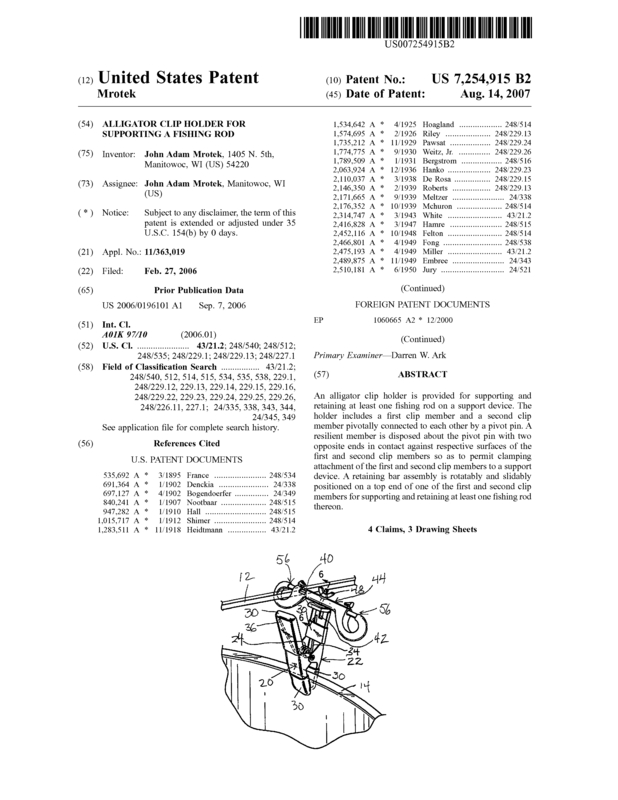 It is protected by U.S. Patent 7254915 and foreign patent 7254915B2. Other advantages of this invention are apparent (i.e. used to secure paint cans or tools to ladders); however, the product is currently only marketed to address a problem occurring in the fishing environment which leaves plenty of room for expansion if so desired. Purchase includes: The purchasing price of the patent includes full exclusive rights and complete knowledge of manufacturing process, inventory of parts, list of part suppliers, list of sales contacts, and all supporting marketing materials. The NOGO Clamp is trademarked and has a barcode to make it easier for retail sales. The NOGO Clamp has a registered domain name, website and e-mail address that will be transferred to the purchaser at the time of sale (www.nogoclamp.com). The website has been redesigned and now requires no special soft ware for easy of transfer. The website receives between 300 to 500 hits per month! The NOGO Clamp is a highly marketable product with tremendous opportunity! Purchase excludes: Legal fees. Page created at 2019-04-24 18:03:27, Patent Auction Time.